In this episode of Get It Done, we show you how to build an ottoman – suitable for multipurposes. To make the legs for your ottoman, get three square pieces of supa-wood roughly 10cm by 10cm square and glue them together with strong wood glue. Clamp them together and set aside to dry completely. Now it’s time to start making the ottomann. First you’ll need to build the frame for the base. Take the two long side pieces and the two shorter end bits and screw them together to create a rectangular box. You’ll need to drill pilot holes on the inside of the larger piece (with a drill bit the same size as the screws you’re using) and you’ll need to drill pilot holes on the sides of the two shorter pieces. (use a drill-bit slightly smaller than the screws you’re using). Make sure you line-up the holes on each side so that the screws can go through both pieces at once. Next you need to attach the bottom piece to the box you’ve just built. To do this, place the box on top the bottom piece and draw a pencil line around the inside bottom. Mark on the bottom piece where you want your screws to go and then match those on the underside of the box. Drill pilot holes and then screw the bottom to the box. Set aside the base and move on to the lid of the ottoman. 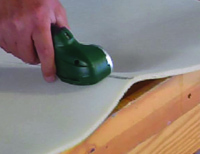 Place the piece of supa-wood you’re using as your lid on your workbench, cover one side with spray-on adhesive and then glue the thick, dense piece of foam onto it. Now you’ll need to cut the thin foam for the lid and the sides of the base. Cut one piece for the lid and one for each side of the base. Cut them slightly larger than the sides so that they overlap. To upholster the base, first glue the thin foam you pre-cut to all four sides (the two long ones and the two short ones). It doesn’t have to extend far over the base, but make sure you’ve cut it wide enough to fold over the top of the frame. Cut squares out of the corners so that everything fits together nicely. Set this aside for the glue to dry. Place your material face down on top of your workbench. Place the thin foam on top of this, and then put the lid on top of the thin foam with the thick foam facing down. Now you’re ready to start tacking the material in place. Starting on one side, pull the material over the lid and tack into place. Complete one side and then move on to the opposite side. 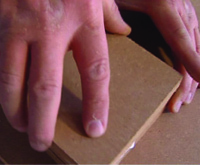 Make sure you pull the material tight, but not too tight as that makes bumps in the foam. When doing the corners, fold carefully so that you don’t get any lines. Place the material and thin foam on your workbench and then place the base frame on top of it. 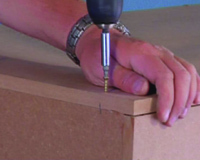 Once you’ve got your material in place, secure the first edge with a few pins to hold it in place. Pull the material taut and line up the two ends. Start tacking the material down where the two ends meet. Tack the whole one side of the base first. Cut away any excess sponge at the top end and then fold the material over the top rim and then tack into place. Do this for both long sides, keeping tension on the material the whole time. Be generous with your tacks – the more you put in, the better your ottoman will look. Put everything to one side and bring your legs back. With a round object, draw a semi-circle on three of the corners of each leg. 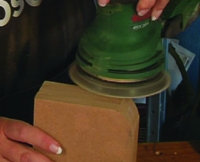 Cut away the semi-circle with a jigsaw and then smooth the rough edges of the legs with a sander. Paint them to complement your material. Attach the legs to the corners of the ottoman by drilling pilot holes in each corner of the base and screwing through it into the legs. On the underside of the lid, screw four pieces of thin wood on each side towards the edges. These will prevent your lid sliding off.